In late March, the Bishop Shanahan High School forensics team competed at the Pennsylvania High School Speech League state finals at Susquehanna University. Fourteen members of the Shanahan team, shown above, finished among the best in the state. 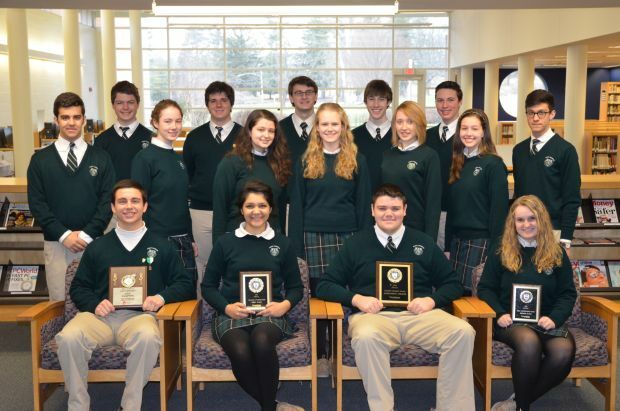 Receiving special recognition were (front row, from left): junior Dan Lindstrom who placed fourth in Oral Interpretation – Poetry; senior Jasmine Lidhar who was state champion in Dramatic Presentation; senior Joseph D’Antonio who was state champion for Outstanding Speaker and was also a member of Student Congress Senate; and junior Courtney Brennan who placed second in Oral Interpretation – Prose.